Order your 1 oz 2019 Austrian Philharmonic platinum coin from our online store today for the Internet’s best price. The first platinum coin in this iconic series was released in 2016, with the silver coin debuted in 2008 and the original gold series seeing inception in 1989. The reverse of the coin features a selection of musical instruments, including the bassoon, Vienna horn, harp, cello and violin, artfully arrayed and in crisp detail. Also on the reverse, the Vienna philharmonic title in German and a light, textured frame. The obverse of the coin features the Great Organ that stands in Vienna’s famed concert hall, the Musikverein, also shown in meticulous detail. Also on the obverse, the Austrian legend, details of metal weight, purity and content, as well as the coin’s 100 Euro denominational value, all inscribed in German. Founded in 1842, the Vienna Philharmonic Orchestra is considered one of the best in the world, making it an obvious choice for coinage from the renowned Austrian Mint. Celebrate world class artistry and mintage while you diversify your portfolio with a 1 oz 2019 Austrian Philharmonic platinum coin today. 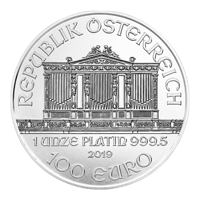 1 oz 2019 Austrian Philharmonic Platinum Coin Order your 1 oz 2019 Austrian Philharmonic platinum coin from our online store today for the Internet’s best price. The first platinum coin in this iconic series was released in 2016, with the silver coin debuted in 2008 and the original gold series seeing inception in 1989. The reverse of the coin features a selection of musical instruments, including the bassoon, Vienna horn, harp, cello and violin, artfully arrayed and in crisp detail. Also on the reverse, the Vienna philharmonic title in German and a light, textured frame. The obverse of the coin features the Great Organ that stands in Vienna’s famed concert hall, the Musikverein, also shown in meticulous detail. Also on the obverse, the Austrian legend, details of metal weight, purity and content, as well as the coin’s 100 Euro denominational value, all inscribed in German. Founded in 1842, the Vienna Philharmonic Orchestra is considered one of the best in the world, making it an obvious choice for coinage from the renowned Austrian Mint. Celebrate world class artistry and mintage while you diversify your portfolio with a 1 oz 2019 Austrian Philharmonic platinum coin today.